Start off with some breakfast at The Roadhouse Restaurant and Inn. The exterior of the Roadhouse is evident in the scene where Donna Hayward sneaks off to a bar and sets off a brawl in season one. Next, head south on Highway 202 to Snoqualmie Falls and Salish Lodge & Spa. Enjoy the soul-changing, dramatic view of the 270-foot-tall waterfall that appears in the show’s opening credits. You can either observe the the falls from an observation deck or hike down to the bottom. After taking in the Falls, head over to the Salish Lodge & Spa, AKA the Great Northern Hotel, which served as the home base for FBI agent Dale Cooper. Visit the gift shop or one of their dining spots for refreshments: a meal or a drink with a view! Continuing east on Highway 202 brings you to historic Snoqualmie where you can visit the gazebo and enormous, 12 foot diameter log, featured it into the pilot episode. Next up is the Old Weyerhauser Mill, AKA Packard Sawmill/Twin Peaks Sheriff Office. The admin office was used as the Twin Peaks Sheriff’s department office exteriors (series) and interiors (pilot). It is currently the home of Dirtfish Rally School. Just down the road is the Reinig Bridge (AKA Ronette’s Bridge, a bridge that carries the Snoqualmie Valley Trail across the Snoqualmie River. In the Twin Peaks pilot, Ronette Pulaski, a classmate of Laura’s, is discovered wandering across this bridge after having been attacked. After checking out the bridge, take a few minutes to walk down the trail and take in the beauty. Head to downtown North Bend next and stop in at Pioneer Coffee. Although this wasn’t featured in the T.V. show, this coffee shop sells Twin Peaks art created by a local artist. To see the art you will have to visit the bathroom. End your day with a famous piece of Cherry Pie from Twedes Café (AKA Double R Diner). 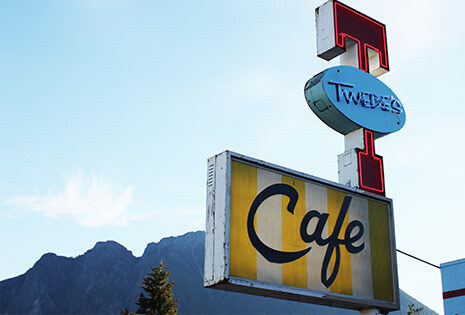 The scenes for the diner were filmed at Twede’s Cafe, where Dale Cooper ate his dessert. After your treat, take in the beauty of the commanding Mt Si that towers over North Bend and gives the show its name.